Ricotta is such a pliable ingredient to work with, and I love the fact it can be used in both savoury and sweet dishes. This ricotta mousse is extremely easy to make but don’t let the simplicity deter you from serving this to guests. Serve the mousse in stemmed glasses, then drizzle with some homemade salted caramel fudge, top with some colourful berries and almond slivers and you have a chic and sophisticated dessert offering within minutes. Ricotta Mousse with Salted Caramel Fudge. Combine the ricotta, condensed milk and vanilla in a large mixing bowl. Using a stick blender puree the ricotta until the mixture is smooth and creamy in texture. Cover the bowl with cling wrap and set aside in the freezer for 10 minutes to set. Place the coconut cream, condensed milk, rice malt syrup and a large pinch of salt into a saucepan over medium heat. Stir continuously until the syrup starts to boil, reduce heat and simmer for 5 minutes until the mixture thickens into fudge. Remove from heat. Bring coconut cream, condensed milk, rice malt syrup and a large pinch of sea salt to a boil then simmer until the fudge turns caramel coloured and has thickened. Remove the ricotta mousse from the freezer and spoon evenly into small serving glasses. Only fill the glasses ¾ of the way. Fill glasses ¾ full with the Ricotta Mousse, then place in the freezer for 10 minutes to set. 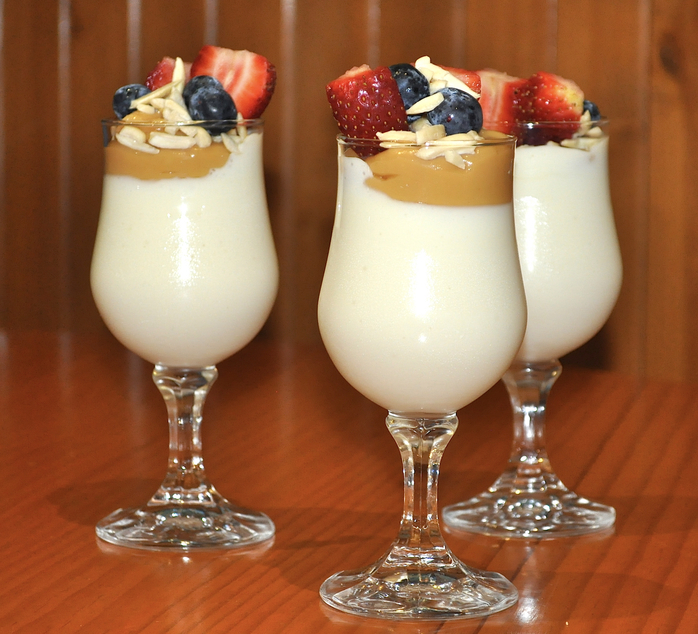 Drizzle the caramel fudge over the top of the ricotta mousse and garnish with some fresh fruit such as strawberries and blueberries and blanched almond slivers. Refrigerate until required.